Highlights from Beijing Auto Show: Along with the downturn in the Chinese economy and the growing popularity of SUVs with car shoppers, plug-in electric vehicles have been providing a central theme at this year’s Beijing auto show. Government incentives for electric vehicles continue to be influential in automaker commitment to rolling out more electrified models; along with an understanding of the worsening of air pollution in China’s fast-developing cities. Faraday Future’s investor LeEco (formerly called LeTV, or China’s Netflix, and led by billionaire founder Jia Yueting) unveiled the LeSEE concept car. While the Batmobile-like Faraday FFZERO1 turned heads at the CES show in Las Vegas earlier this year, LeEco appears to be more of a Model S-like electric luxury car than a high-performance supercar. 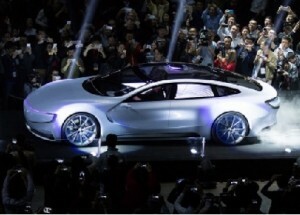 LeEco CEO Yueting touted the car’s user-friendly features including memory foam seats, automatic driving mode and a steering wheel that folds toward the dash when the car is in autopilot mode to give the driver more space. It’s a sleek four-door sedan with suicide doors. Volkswagen is attempting to distance itself from the diesel car reporting scandal with the T-Prime Concept GTE, a plug-in SUV that may become the next Touareg. The T-Prime is powered by a 375-horsepower that combined battery and 2-liter engine; it will go 34 miles on electricity alone before the gas engine kicks in. Plug-in hybrid Corollas will be the first stepping stone for Toyota to meet stringent emissions standards and to receive incentives for doing so in China, according to Toyota executive Hiroji Onishi. Toyota plans to launch plug-in hybrid versions of the Toyota Corolla and Levin in China in 2018; the Levin is built on the same platform as the Corolla. Ford will start its green car rollout in China with the launch of the hybrid version of the Mondeo later this year. The next step will be the C-Max Energi plug-in hybrid arriving in early 2017. Ford will be bringing to the Chinese market vehicles with a downsized turbocharged engine, a traditional hybrid powertrain, a plug-in hybrid setup, and eventually an all-electric variant, to meet strict emissions standards tightening up over the next five years, the company said. Chinese carmakers showed off a list of concept electric vehicles at the show (and some that have been in production for a few years), including offerings from BAIC, Beijing Auto, BYD, Chery, FAW, Jianghuai Motor Co., and SAIC. Karma Automotive continues to change its name in its post-Fisker Automotive identity, with Chinese auto parts giant Wanxiang Group as its owner. Its plug-in hybrid sports car is now called the Revero, and will go on sale later this year. The new name is a combination of the Latin “re” and “vero,” which the company says translates to “truth,” the company says. The company declined to divulge the price range for the new vehicle or provide a delivery date. Karma plans to formally unveil this summer with a new battery and charger and electrical controls. Ridesharing giants Uber and Lyft settled legal and regulatory battles last week. Uber will pay up to $100 million to drivers who had sought to be classified as employees in California and Massachusetts. That settled two lawsuits that posed a threat to the company’s on-demand business model, which relies on independent contractors. Drivers will continue to be considered independent contractors and not employees. The settlement brings to a close what employment experts believe was the biggest existential threat to the fast-growing start-up. In the ruling, Uber is being required to institute several changes in the way it disciplines drivers. The company will no longer be able to deactivate drivers’ accounts at will. Drivers will now receive warnings and have an opportunity to correct any issues before they are cut from the service. Uber will also make it clear to riders that tips are not included in Uber’s fares. Drivers will be permitted to solicit tips from passengers – a policy that competitor Lyft has long offered. The carpooling decision and specific guidelines to Uber still need to be approved by Judge Edward Chen of the District Court of Northern California, which should take several months to finalize. Uber and Lyft will need to wait for California regulators to rule on another issue: whether they’ll be permitted to offer short-term car rental programs to their drivers. Lyft has been working with its major investor, General Motors, on a program in Chicago where Lyft drivers can lease Chevrolets for up to eight weeks as part of the Express Drive program. California regulators are mulling over whether to block it from some of the country’s biggest car-booking markets in that state. Regulators are concerned that short-term leases enable Uber and Lyft’s fleet to act as taxi drivers without being subject to the same rules. Another legal issue still being pondered is whether Uber and Lyft will be required to have fingerprint background checks on its drivers, which other ground transportation service providers are required to carry out. Lyft does have to adopt practices already in place with Uber; its drivers will need to have annual inspections of their vehicles conducted by certified vendors. Uber and Lyft did have a victory in the California rulings by the California Public Utilities Commission. State regulators on Thursday granted companies such as Uber and Lyft permission to offer carpooling, sanctioning a service that has allowed fast-growing San Francisco companies to offer lower-cost rides. These services are called “ridesharing” by these ride-hailing companies and operate under the brands UberPool and Lyft Lanes. 5 mpg standard: Automakers are doing more than ever before to meet national fuel efficiency standards, with 56 percent of available vehicle models matching or exceeding today’s targets, according analysis of vehicle data by the Consumer Federation of America (CFA). “Fuel efficiency increasingly comes standard with new cars, trucks, and SUVs” said Jack Gillis, Director of Public Affairs for CFA. Model year 2016 is the third in a row in which more than half of all passenger car and truck models offered for sale in the United States meet or beat the national standards, according to the CFA. Honda Clarity and Accord Hybrid: Honda had a few major announcement last week in its green vehicle offerings. The Honda Clarity Fuel Cell vehicle went on sale in Japan last month and will be offered in the U.S. late this year with a range of 300 miles and a refueling time of three-to-five minutes. The Clarity Fuel Cell will be followed by an all-electric Clarity next year that will launch in California and other states still to be determined. By the end of 2017, Honda will add the Clarity Plug-in Hybrid that can go 40 miles before the extended range kicks in. Honda also gave details on the new 2017 Accord Hybrid. Honda expects to double sales of 2017 Accord Hybrid when it goes on sale this spring. The new Accord Hybrid is expected to get 49 miles per gallon in the city and 47 mpg on the highway for a combined 48 miles per gallon under new, more stringent U.S. EPA tests. Vehicle Technologies program funding: The U.S. Senate voted Wednesday to reauthorize a $1.6 billion for the U.S. Dept. of Energy’s Vehicle Technologies program, which is intended bolster development of hybrid and electric vehicles. The Senate energy bill calls for spending about $339 million per year “to support domestic research, development, engineering, demonstration and commercial application and manufacturing of advanced vehicles, engines and components. The approval came despite objections of conservative groups that have complained about past government loans to auto companies — including Fisker Automotive — that have gone bankrupt. ZEV bus funding: The Federal Transit Administration (FTA) announced that it will provide $22.5 million in funding for seven different transit properties to purchase 51 zero emission buses. The FTA also announced that an additional solicitation is now on the street that would provide a total of $55 million for the purchase of additional low and no emission buses. “The FTA is providing catalytic investment that will help spur the growth of the zero emission bus market. 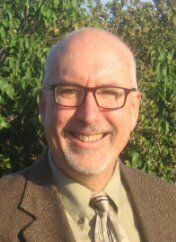 It’s very possible that as a direct result of this FTA program by 2020 ten percent of all new transit buses sold will be emission free,” said CALSTART President and CEO John Boesel. Nissan takes on Model 3 in ad: A new Nissan Leaf ad campaign is poking fun at how long it will take for the Tesla Model 3 to end up in owners’ garages starting in late 2017. ““Why wait when you can drive an all-electric Leaf now?” Nissan asks in the ads. “And why drop $1,000 to stand in line when you can get $4,000 cash back and best-in-class range?” The ads remind consumers that Nissan has been mass-producing the Leaf since 2010. Volvo wants to sell one million electrified vehicles by 2025 with “at least two” hybrid versions of every model, as well as an all-electric car. The latter will come in 2019. Volvo’s CEO Hakan Samuelsson is aware that the million electrified cars sold by 2025 are an aspiring target, but he explained that it is “deliberately ambitious.” So far, Volvo has only released the C30 battery electric vehicle. Hydrogen fuel cell buses: New Flyer of America has completed a demonstration of the Xcelsior XHE60 heavy-duty articulated hydrogen fuel cell transit bus. Representatives from Alameda County Transit (AC Transit) of California and the Metro Transit of Minneapolis – were on hand to participate in the vehicle’s debut and demonstration. Based on the Xcelsior X60 heavy-duty transit bus platform, New Flyer partnered with Ballard Power Systems Inc. and Siemens to develop the hydrogen fuel cell propulsion system. The Volkswagen diesel car emissions reporting scandal has triggered a wave of regulatory pressure in the U.S., Europe, and Asia. It’s going way beyond the VW brands, as Mitsubishi faces pressure on honest mpg fuel economy reporting that harkens back to Hyundai, Kia, and Ford in 2012-14. Mercedes-Benz is now facing diesel exhaust emissions reporting pressure in the U.S. and Europe. As covered last week in Green Auto Market, China is setting the pace on where sustainability and emissions reporting is heading in the auto industry. Beyond incentivizing electric vehicle sales, the Chinese government is setting the strictest standards on reducing air pollution. Regulators around the world are getting tougher on automakers after a series of cheating scandals on fuel economy and emissions, with China set to become the strictest, said Ford CEO Mark Fields. While stricter standards are being adopted around the world on greenhouse gas emissions and fuel economy, China will be the toughest regulatory regime over the next five years “given some of the societal factors around air pollution,” Fields said. Fields spoke to reporters on the eve of the Beijing Auto Show, China’s largest car show. Ford faced a reporting scandal of its own in 2013 and 2014, when it twice lowered the mileage ratings of several hybrid models. Fields said that Ford is supportive of Europe considering on-road testing for emissions and would comply if China follows suit. VW settlement in U.S.: On Thursday, VW agreed to a tentative plan with the U.S. Environmental Protection Agency and the California Air Resources Board to buy back or repair 500,000 diesel-powered cars sold in the U.S. Consumers now have the choice of whether to sell their vehicles back to Volkswagen or get repairs. The deal includes “substantial compensation” for owners of cars powered by two-liter “clean diesel” engines that were fitted with software to cheat emissions tests, U.S. District Judge Charles Breyer said during the hearing in San Francisco. VW will be required to invest funds to “promote green automotive” initiatives and establish an environmental remediation fund to offset the years of cars putting out nitrogen oxide emissions at harmful levels. The judge issued a gag order and scolded parties for leaking previous details to the media as more finalized details on the settlement will be released later affecting the VW, Audi, and Porsche brands. VW still faces as many as 50 attorney general fraud cases for false advertisement, having made claims that its vehicles are a clean alternative to hybrids. VW also faces lawsuits from dealerships and customers. Recall in Germany: The vehicle recall related to diesel emissions management software has added two more automakers – Daimler and General Motors – in a German government ruling. That government has ordered recalls and testing for NOx emissions in diesel cars for VW, Audi, Porsche, and Daimler’s Mercedes-Benz and GM’s Opel brands with about 630,000 diesel cars being recalled for a software fix. BMW was not part of the recall. German motor transport authority KBA had done extensive testing on diesel cars and determined automakers have been using a legal loophole allowing them to throttle back emissions treatments under certain circumstances, with OEMs claiming that’s been done to protect engines. The decision in Germany is yet another challenge VW is facing in global markets. VW Group is recalling 8.5 million cars in Europe that are among 11 million diesel cars sold worldwide by its VW, Audi, Porsche, Skoda, and Seat brands equipped with emissions-cheating software. The U.K. government just released results after testing 37 car models on NOx emissions reporting; it found that only VW has been using so-called defeat devices. Mitsubishi mileage scandal: Mitsubishi has admitted manipulating fuel economy ratings for its vehicles sold in the Japanese market. The company said it had overstated the fuel efficiency of 625,000 cars. Media outlets have reported that the Japanese automakers had submitted misleading mileage data on its i-MiEV electric car, which is also sold overseas. The automaker is also suspected of using non-Japanese test methodology on its RVR, Outlander, Pajero, and Minicab MiEV models. The scandal expanded on Friday as the U.S. National Highway Traffic Safety Administration said it was seeking information; it may affect at least one more model than disclosed and likely several others. In Japan, the government may mandate that Mitsubishi will have to reimburse consumers and the government if investigations find the vehicles were not as fuel-efficient as claimed. Daimler diesel emissions: Along with its recall in Germany, Daimler AG is facing more scrutiny in the U.S. market. On Thursday, the company said it is conducting an internal investigation of its certification process for diesel exhaust emissions at the request of the U.S. Justice Department. The latest action stems from an EPA request in February for information from Daimler coming from a lawsuit filed by U.S. Mercedes owners. In early April, owners of U.S. Mercedes diesel cars filed a new class action suit by U.S. law firm Hagens Berman, which had already filed a complaint in February. The suit claimed its vehicles likely contained a “defeat device” used to cheat emissions testing, an accusation that Daimler denied. Daimler said the lawsuits “are considered to be without merit and Daimler will defend itself against them with all available legal means.” The automaker has committed to cooperate fully with U.S. government investigations. Corporate sustainability day at ACT Expo: Corporate sustainability will be the leading issue on Thursday, May 5, Advanced Clean Transportation (ACT) Expo in Long Beach, Calif. Corporations and government agencies are looking at their fleet operations more closely as air quality regulations become increasingly stringent and global fuel costs remain volatile. Transportation is the fastest growing source of carbon dioxide and causes approximately 60% to 70% of greenhouse gas emissions for most mid-size cities. Executives from Walmart, Coca-Cola, Penske, Unilever, SoCalGas, ZipCar, and more will share insight on how your organization can: reduce its carbon footprint; proactively address continually tightening emissions regulations; gain a competitive business advantage; and mitigate the impact of volatile petroleum prices. Panel topics will include fleet operators that have gone beyond basic compliance to prove that sustainability can make both sense and cents for their fleets; creating a sustainable freight transportation action plan; and, how companies like Uber, Lyft, ZipCar, Amazon, InstaCart, and Google have completely disrupted the urban mobility landscape. To participate, register for the full conference or a May 5 pass. Siemens and Valeo making engines: German engineering giant Siemens and French auto supplier Valeo are teaming up to serve the growing European market by making engines for electric and hybrid vehicles. The joint venture will have headquarters in Erlangen, Germany and facilities in France, Norway, Poland, Hungary and China and is to become operational in late 2016. The venture will develop and sell high-voltage electric motors, range extenders, and chargers used in electric vehicles and light commercial vehicles. “With the expertise offered by Siemens, a leader in power electronics and electric motor products, Valeo would maintain its technological lead by offering a comprehensive line-up of technologies ranging from micro-hybrid to all-electric solutions,” said Valoe chief executive Jacques Aschenbroich. Hyperloop recruiting staff: Hyperloop sent staff to Detroit last week to recruit automotive engineers and designers. Hyperloop’s creators, including Tesla CEO Elon Musk, hope the system will one day transport pressurized capsules through tubes at speeds in excess of 700 mph. Brogan BamBrogan, Hyperloop Technology’s chief technology officer and co-founder, spoke at the SAE 2016 World Congress Wednesday and said that the Los Angeles firm is setting up a full-scale, two-mile working prototype north of Las Vegas that should be operating by the end of this year. Republic grows its CNG fleet: Republic Services, Inc., expanded its fleet of compressed natural gas solid waste collection trucks with the addition of 62 CNG trucks in Broward and Dade counties. These new CNG trucks will replace the previously used diesel-powered collection trucks and will accelerate the total number of natural gas vehicles operating in South Florida to 127. Pollution is a growing concern in today’s world, and keeping that in mind, the company has been taking initiatives to reduce carbon emission. Being one of the renowned operators of a large vocational fleet in South Florida, Republic Services strives to make a positive impact on the environment. EPA rule on racecar conversions: The U.S. Environmental Protection agency will drop controversial language from a proposed heavy- and medium-duty truck rule that had sparked fears of a ban on street-to-race car conversions and recent scrutiny from Republican lawmakers. It had been part of a 629-page proposal published last June to slash carbon emissions by medium- and heavy-duty trucks. In February, the Specialty Equipment Market Association issued a warning that the EPA sought to prohibit the type of modifications made to street cars converted for racing use that amateur racers have taken to the track for decades. Mahindra e20 rolls out: Mahindra has rolled out a small electric car in the United Kingdom. The Mahindra e2o follows its G-Wiz electric model. After applying the government grant for EVs, the price of the Mahindra e2o shrinks to £12,995 ($18,707). This makes the e2o cheaper than the Renault Zoe, priced at £18,445 ($26,553). Compared to the latter nameplates, the e20 is on the small side of EVs, measuring 129.1 inches in length and 59.6 inches in width. The e20 has a 13.9 kWh battery pack and a range of 79 miles on a full charge. More than 200 miles per charge: The U.S. Department of Energy’s National Renewable Energy Lab released a study last week on what U.S. consumer think about plug-in electric vehicles. A pure electric vehicle would need to be able to go 300 miles once charged for 56 percent of the survey respondents to be willing to consider purchasing one. As for buying an EV, survey respondents leaned a little bit toward plug-in hybrids. When asked to name any EVs that they knew of, 20 percent named the Chevrolet Volt, 18 percent the Toyota Prius Plug-In, 14 percent the Model S, and 10 percent the Nissan Leaf. Another electric utility goes to EVs: Arizona Public Service Co. is following the lead set by two other utilities, Florida Power & Light and Pacific Gas & Electric. APS is swapping out its more than 2,100 cars, SUVs and trucks with electric vehicles over its replacement cycle. A specific completion date has not be specified. ATVs and bucket trucks are also slated for replacement with electric alternatives over time and as technology permits. “Just as we’ve worked to modernize our grid and provide cleaner energy, we are now modernizing our fleet to reduce our carbon footprint,” said Donna Easterly, vice president and chief procurement officer with APS. How China has become the largest plug-in electric vehicle market in the world; and how Chinese investors have put millions of dollars into U.S. companies with electric drive technology. Editor’s note: This is the introduction to an upcoming $15 market report I’m writing that will include sales figures, pricing information, incentives, and specs on electric vehicles being built in China; and a section of the report focused on U.S.-based companies serving the Chinese EV market. China has experienced tremendous economic growth in the past 30 years, with workers moving from farmlands and small towns to metro areas for jobs and buying their very first cars. Ten years ago, Chinese consumers purchased about six million new vehicles annually, but last year that number had increased to 21.1 million passenger cars (sedans, SUVs, and minivans); that made for about a quarter of global sales and a huge share of profits for major automakers. Global automakers see China as the largest and most important market for manufacturing and sales, and have created joint ventures with government-backed companies to expand their global presence. General Motors sold 35% of its new vehicles in China last year through GM China and its joint ventures. GM’s Buick brand is heavily invested in that market – selling 919,582 Buicks last year in China, versus 228,963 in the U.S. GM China has committed to bringing in 10 “greener” vehicles into its product lineup in the next few years, including the Cadillac CT6 Plug-in Hybrid Electric Vehicle. In 2015 and into 2016, automakers and their dealer networks faced downturns and instability in sales in the Chinese market. A plunging stock market in the first part of 2016 and rising house prices have had their economic impact on car sales. Dealers in China have become reluctant to put too much vehicle inventory on car lots amid concerns about the broader economy and stock market. In China, the government remains committed to growing plug-in hybrid and battery electric vehicle production and sales. Air pollution in Beijing and other major Chinese cities have been driving the incentives and sales for more electric vehicles (EVs) to make it to China’s increasingly congested roads. As passenger and commercial vehicles pour into cities, the air pollution has been getting worse – as was observed during the 2008 summer Olympics in Beijing. What are new energy vehicles? The Chinese government uses the policy term “new energy vehicles” to designate plug-in electric vehicles, and only battery electric vehicles and plug-in hybrid electric vehicles are eligible for purchase incentives. Initially, conventional hybrids were included in the incentives with plug-in EVs. More recently only plug-in EVs are eligible for the government incentives, which consist of subsidies and tax cuts. China’s new energy vehicle sales have seen rapid growth in the past two years thanks to these incentives. The country finished in first place for global EV sales last year. China made up 34.2% of global plug-in electric vehicle sales in 2015 with 176,627 sold; in the U.S, 115,262 plug-ins were sold last year. 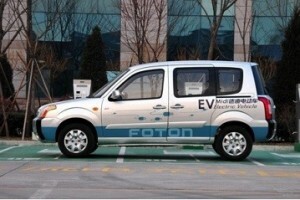 In China, EV sales have been heavily subsidized by the national government and local branches. There’s been an assumption by global automakers that the market’s EV sales will continue to grow – enough for major OEMs to invest heavily in the market, many times in joint ventures with Chinese companies. Chinese automaker BYD says car shoppers are more interested in owning an EV due to the air pollution in China – and this unpleasant reality is making for an effective marketing message. One of BYD’s online ads shows a man in a cloud of pollution calling for help from China’s fabled Monkey King hero. Government policies have given Chinese investors and Chinese companies the confidence to sink millions of dollars into U.S. companies with electric drive technology. While some of these vehicles may end up in the U.S. and other global markets, Chinese investors want to focus primarily on the China market. Nissan, Tesla Motors, and other automakers would tend to agree, and are investing heavily in the China market to grow EV sales well beyond the U.S. and Europe. Chinese automakers BYD, BAIC, Chery, SAIC, Zotye, and others, have EV models in pre-production and several EV models on the market being sold by dealers; their EVs are explored in this study. Subsidies for the new energy vehicles have started to decline, but they’re not going away any time soon. One assessment states that about $4.56 billion in local and central government incentives were spent last year. The government’s five year’s plan will see subsidies in 2017 and 2018 reduced by 20% from 2016 levels; and another 20% will be cut in 2019 and 2020. There have been media reports made of fraudulent sales transactions reported in 2015, and government agencies are conducting investigations. EV sales numbers tripled last year in China, and the data may have been “padded” with some of the EVs being counted twice in the total. Another factor analyzed by global auto analysts comparing EV sales around the world is that China’s new energy vehicle policy counts low-speed, neighborhood electric vehicles in its sales figures. Chinese automaker Kandi has been offering its small, low-speed EV for retail sale in China and for its carsharing service; but its sales numbers have been low so far. Whatever findings end up being adopted and reported, China is expected to remain the leading EV market ahead of the U.S. and Europe. A decade ago in the U.S., EVs were a hot commodity for venture capital firms in Silicon Valley and beyond along with other cleantech sectors. Up until about four years ago, you could attend auto shows and fleet events and check out a myriad of plug-ins from companies no longer in business including Fisker Automotive, Coda Automotive, Bright Automotive, and Aptera Motors. In the early days of EV mass market sales from 2011 to 2014 in the U.S., automotive analysts and EV advocates were pleased to see strong numbers coming from the Nissan Leaf, Chevrolet Volt, Tesla Model S, Toyota Prius Plug-in, and BMW i3. Overall EV sales numbers in the U.S. began declining last year for reasons yet to be clearly understood. Cheap gasoline may have had something to do with it, although gas prices are thought to have more impact on hybrid sales than EVs. The fascination may be over for early adopters and consumers who needed to be first in line for cool new technologies like smartphones and EVs. Executives at global automakers expect EV sales to eventually increase as consumers and fleets become accustomed to the new technologies – and lithium batteries are capable of 200-plus miles or more per charge while pre-incentive sticker prices on EVs come down to $35,000 or less. They also see government fuel economy and emissions mandates in the U.S. and Europe being a big driver behind their product planning, which includes a rich line of new EV models in the next few years. While the EV sales numbers from the past two years may not stay high long term, most automakers do see China as the most important market to secure a solid platform for manufacturing and selling EVs. The numbers have been impressive so far this year. According to the statistics compiled by China Association of Automobile Manufacturers (CAAM), for the first two months of 2016, the production and sales of new energy vehicles reached 37,937 units and 35,726 units respectively, both increasing 1.7 times year on year. The production and sales of BEVs reached 27,850 units and 24,835 units, increasing 2.6 times and 2.7 times year on year; and such figures for PHEVs were 10,087 units and 10,891 units, increasing 60.1% and 68.5% year on year. India may also be an important market for EV sales, with ambitious government targets and incentives being recently announced. Indian automakers could be well positioned to meet some of those targets, but having EVs delivered from Chinese production plants might be needed to meet those Indian government mandates. In late March 2016, Piyush Goyal, India’s minister of state for power, said India has the potential to become the first nation of its size to be 100% electric vehicles by 2030. Government policies set in 2013 laid out India’s goal to put six to seven million hybrid and electric vehicles on its roads by 2020. The country has been subsidizing new EVs as well as conversions to electrify existing traditional gasoline and diesel engine vehicles. India’s largest automakers are just getting started in EV production and sales. Tata Motors is moving towards hybrids and electric vehicles. The Mumbai-based company, traditionally dependent on diesel engines, is working on partial hybrids and all-electric drive systems for its future list of passenger vehicles. Mahindra recently launched its first EV, the e20 low-priced electric car, in the United Kingdom. China’s top carmaker SAIC Motor Corp, and Great Wall Motor, its biggest maker of SUVs, are leading the way on selling new vehicles in India, one of the world’s fastest growing auto markets, as growth at home in China stagnates. Both SAIC and Great Wall are producing EVs, and could make these products part of their market strategies in India. Major automakers like Nissan are looking at both China and India to best serve their global EV sales targets. This market report looks at the state of China-based automakers and their EV product lineups; and where things stand with U.S.-based automakers and suppliers building electric drive technologies with the support of Chinese investors. 1. Model X recall: Tesla Motors has initiated a voluntary recall of 2,700 Model X sport utility vehicles due to problems with the third-row seats. The company was conducting an internal strength test prior to shipping Model X deliveries to Europe, and found that the third-row recliner unexpectedly slipped. The affected customers, all of whom live in the U.S., were sent an email about the recall. The Model X can still be driven prior to a recall, although Tesla is asking that passengers don’t sit in the third row seats until the SUV has been fixed. The recall affects vehicles that were made and delivered beginning in September and which were made before March 26. Tesla is now assembling new third-row seat backs and expects to replace them all within five weeks. Mobility projects: Automakers are continuing to launch test projects for mobility services of the future. Jaguar Land Rover launched a technology venture named InMotion on Monday which aims to create apps for services such as carsharing. InMotion will begin testing carsharing mobile apps in North America, Europe, and Asia in the near future. JLR and other automakers are trying to appeal to younger consumers in major global cities who are less likely to buy a car and have been attracted by new services such as carsharing veteran Zipcar and rideshare giant Uber…… Volvo will be adding to locations to its Drive Me autonomous driving pilot projects. The U.S. has been added to the list, soon after announcing that China will be part of it. Drive Me will be launched in Gothenburg, Sweden, in late 2017. In China, up to 100 self-driving cars will be tested by local drivers on public roads in limited driving situations, such as on express roads and highways…… BMW is getting back into the carsharing business with ReachNow, which is starting with 370 cars in its point-to-point carsharing business. ReachNow will offer the ability to pick up a car on the street and park in any legal curbside spot near the driver’s destination, rather than in reserved parking spaces. Like Daimler’s Car2Go carsharing firm, ReachNow will offer the ability to pick up a car on the street and park in any legal curbside spot near the driver’s destination, rather than in reserved parking spaces; it will start up in Seattle and move out to other cities. Alternative fuel engine innovations: Cummins Westport Inc. told Trucks.com that its 8.9-liter “near-zero NOx” engine is finishing its field test phase and the company will start taking orders this month. The engine reduces emissions of nitrogen oxide, or NOx, a smog- and ozone-causing product of fuel combustion that is particularly difficult to eradicate. The engine — called the ISL G NZ — is aimed at helping trucking companies meet regulations set by the federal Environmental Protection Agency clean-air standard that phases in from 2023 through 2031……. ROUSH CleanTech has developed a propane autogas fuel system for the Ford F-750 chassis that costs less than similar diesel counterparts. Operating up to 33,000 GVWR, the model was created in response to the growing demand for an autogas-fueled medium-duty chassis for bobtail applications, cylinder delivery trucks, and larger tank setters and box trucks, the company says. Global EV incentives: A new study by Navigant Research examines global demand-side polices for plug-in electric vehicles. PEVs provide a number of advantages over conventional internal combustion engine-powered vehicles, including cost reductions related to vehicle operation and maintenance and the convenience of forgoing gas stations, oil changes, and emissions tests. While these benefits have not been significant enough to justify the high cost of the technology for many consumers, government policies around the world are helping to ensure the supply and demand of PEVs. Government incentives have been critical for gaining support. Western European countries are seeing few incentives and could gain from more government incentives. For example, Germany’s PEV penetration almost matches that of the United States, however incentives are relatively non-existent, which means a modest incentive improvement could create significant impacts for the market on a country and global level, Navigant says. Model 3 may not see tax incentives: Tesla Motors may be able to stretch out federal tax incentives for the upcoming Model 3 by taking a creative approach – at least one discussed online by Tesla owners and analysts. Tesla will likely be approaching the cap placed on automakers of 200,000 electric vehicles sold for the $7,500 tax incentive as soon as 2018. Once the 200,000 mark is reached, the IRS cuts the tax credit in half for the next two quarters to a maximum of $3,750. Then the IRS slashes the tax credit in half again for another two quarters, and the incentive goes away. “We always try to maximize customer happiness even if that means a revenue shortfall in a quarter,” Musk replied on his Twitter page after suggestions were made on Tesla stretching out the timing. Ridesharing legal battles: Ridesharing leaders Lyft and Uber are attempting to sort through legal battles with settlement agreements. A federal judge in California’s Northern District has rejected Lyft Inc.’s proposed $12.25 million settlement to resolve a case filed by California drivers over their status as independent contractors of the ride-hailing service. Under the settlement, Lyft would have avoided changes to a labor model that relies on classifying drivers as independent contractors; the judge thinks drivers have been shortchanged on mileage expenses. Uber has agreed to pay up to $25 million to settle a 2014 lawsuit filed by city officials in San Francisco and Los Angeles who want to see more from Uber on driver safety guarantees. The cities argued that Uber gave customers a “false sense of security” by touting its background checks as the toughest in the industry and are superior to the ones used by the taxi industry. Taxi drivers are given fingerprint checks, but Uber drivers are not. Concerns over federal self-driving car guidelines: As the federal government gets closer to unveiling guidance on deployment of self-driving cars, an auto group has warned that it may be too aggressive. An automaker trade association warned Friday that U.S. auto safety regulators’ timetable for unveiling guidance on the deployment of self-driving cars may be too aggressive. The federal auto safety ageny “should not bind itself to arbitrary, self-imposed deadlines at the expense of robust and thoughtful policy analysis,” said Paul Scullion, safety manager at the Association of Global Automakers, a trade group representing Toyota, Nissan, Hyundai, and other major foreign automakers. “NHTSA should instead consider the development incrementally.” NHTSA Administrator Mark Rosekind said Friday the agency must move quickly, noting cars with significant self-driving features like Tesla Motors Inc’s autopilot function are already on the road. Bay Area AltCar Expo: The third annual Bay Area AltCar Expo & Conference is scheduled to be held May 20-21 at Oakland City Hall and Plaza. It offers a comprehensive program for the latest in vehicle technologies, ride and drive, and public education. The event is being co-presented by the City of Oakland Public Works, the East Bay Clean Cities, and the Bay Area Air Quality Management District. Event partners include: Honda, Nissan, Mercedes-Benz, Smart, San Francisco Clean Cities, Silicon Valley Clean Cities, Breathe California, Association of Bay Area Governments, and the Transportation Sustainability Research Center at UC Berkeley. Honda CR-V plug-in hybrid: We may be seeing a redesigned 2017 Honda CR-V, and with it, a plug-in hybrid version. A Japanese media outlet is reporting that the available plug-in hybrid variant will have a 2.0-liter gas engine that mates with an electric motor. Honda hasn’t announced the fifth-generation CR-V yet, but it’s likely to be coming out around that time with current version having been launched in 2011 and a refreshed model released in 2014. Electric postal vans: Germany’s postal carrier service may be building its own electric vans. Deutsche Post has been planning it for years, and acquired StreetScooter in 2014. StreetScooter is a maker of prototype electric vans that the postal service demonstrated in 2012. Deutsche Post plans to build 2,000 vans this year, which will join a handful of electric vans of various types already in operation. Deutsche Post plans to eventually replace its 30,000-unit fleet of internal combustion vans with electric vehicles. Hyundai Motor Company has been surging forward in the global auto market, and plans to become No. 2 in green car sales after Toyota by 2020. Hyundai unveiled its signature brand last month at the New York Auto Show – the Ioniq – which will be the auto industry’s first-ever model available in hybrid, plug-in hybrid, and battery-electric iterations and built on the same drivetrain. It will be rolling out later this year. Within the next four years, the Korean automaker intends to flood the market with 26 green vehicles, including hybrid, plug-in hybrid, all-electric, and hydrogen-powered models. With 8.01 million vehicles sold through its Hyundai, Kia, and Genesis brands in 2015, Hyundai Motor Co. became the fifth largest global automaker; and the third largest Asian vehicle manufacturer after Toyota and Nissan. Kia and Hyundai surpassed Japanese brands for the first time last year in the J.D. Power 2015 U.S. Initial Quality Study. The automaker plans to sell 300,000 electrified vehicles by 2020, a sizeable gain over the 70,000 electrified vehicles the company sold last year. The near-term Hyundai lineup will include the Sonata hybrid and plug-in hybrid; Ioniq hybrid, plug-in hybrid, and battery electric; Grandeur hybrid; and its Tucson Fuel Cell. The Kia brand will offer the Optima hybrid and plug-in hybrid; Soul EV; Cadenza hybrid; and the upcoming Niro Hybrid. Hyundai says the 2017 Ioniq plug-in hybrid will travel 25 miles on electric power alone in its plug-in hybrid version compared to Toyota’s 22 miles in the new Prius Prime. The fully electric Ioniq will travel 110 miles per full battery charge, which surpasses the current Nissan Leaf but will be overtaken by the upcoming 200 miles-per-charge models. 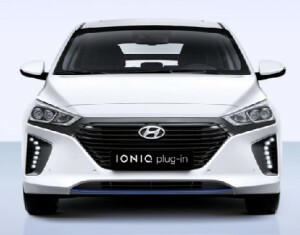 The Ioniq Electric battery electric version will use a 28 kWh lithium-polymer battery, and is expected to deliver 155 miles per charge on the European test cycle; and would likely be lower in the U.S. As previously stated, that could be about 110 miles per charge for the U.S. rating. The electric motor will have 118 horsepower and 218 lb.-ft. of torque. Its top speed is 103 mph. Hyundai’s strategy appears to be driven by a mix of regulatory compliance, an environmental-friendly philosophy, and profitability. “With a goal of having a fleet-wide average of 54.5 MPG by 2025, we’re leading the future of eco-friendly vehicles,” according to Hyundai’s website. Hyundai’s Blue Drive Strategy is another element of Hyundai’s corporate strategy for fuel efficient vehicles and environmentally-friendly vehicle technologies. This has started with some of the Hyundai vehicles such as the i10, more fuel efficient version of the Elantra and Accent, the company said. Hyundai has been far behind other OEMs in its green car lineup, bringing its Sonata Hybrid to market in 2010 and the Tucson Fuel Cell in 2014. It has been driven by Toyota’s leadership, and it does need to become profitable for it to be a viable option. “Except for Toyota, I can achieve some competitiveness against other companies,” said Lee Ki-Sang, head of Hyundai’s eco-car powertrain division. “Our target is before 2020, we would like to make profits on these eco-friendly vehicles,” he said. Hyundai Tucson Fuel Cell drivers have accumulated more than one million miles (as of mid-February) in Southern California since introduction of the hydrogen-powered car in June 2014. The first mass-market produced fuel cell vehicles has been sold to about 100 owners (in February). The Tucson fuel cell model is currently available on a 36-month lease for $499 a month with $2,999 as the down payment. At the Chicago Auto Show, Kia unveiled the 2017 Optima Hybrid and Optima PHEV plug-in hybrid that can travel 27 miles on electricity alone. The Kia Optima recently received a complete redesign. The Kia Optima Hybrid uses the new Optima body, as well as a similar powertrain to the latest generation of the related Hyundai Sonata Hybrid. Like the Sonata, the Optima also gets a plug-in hybrid variant for the first time. Kia also introduced the Niro, the company’s first dedicated hybrid nameplate. Along with being Kia’s first dedicated hybrid, it will have an entirely unique body style. The 2017 Kia Niro is scheduled to go on sale late this year. In November, the 2016 Sonata Plug-in Hybrid became the first plug-in hybrid electric vehicle launched by Hyundai and comes with a 27 mile battery range. The Sonata Plug-in Hybrid’s 9.8 kWh lithium polymer battery system helps deliver 99 MPGe. 1. 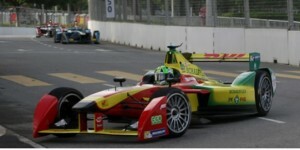 Formula E series: Lucas di Grassi drove his Abt Schaeffler Audi Sport electric racer for a perfect score to win the FIA Formula E Faraday Future Long Beach ePrix on Saturday. The driver had recently had his Formula E victory in Mexico City taken away after a post-race disqualification, so the victory in Long Beach and regaining the series point lead was a big win for the team. This victory is taking place during the second annual FIA Formula E series at its stop in Long Beach, Calif. Faraday Future was recently named the title sponsor for the 2016 Long Beach ePrix, the sixth stop on the 2015/2016 Formula E race season. Formula E was started up by veteran Spanish racing promoter Alejandro Agag, and was officially launched in September 2014 in Beijing. Sponsors and promoters of the race series are quite hopeful Formula E will educate and inspire people to see the potential of electric drives to power vehicles of all types quietly and with zero emissions. 2. VW and dealers: Volkswagen brand CEO Herbert Diess talked to media and to dealers during the National Automobile Dealers Association convention to deal with the diesel car emissions reporting scandal. Jason Kuhn, owner and Chairman of Kuhn Automotive Group, was chosen over the weekend by other VW dealers to lead a committee in negotiations with VW management. Kuhn and other VW dealers are talking to the German automaker about dealing with the crisis in a way to keep the VW brand viable with car shoppers. 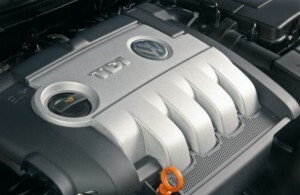 Volkswagen Group of America is now facing a suit filed by the U.S. Federal Trade Commission for falsely advertising that hundreds of thousands of diesel vehicles were environmentally friendly when that was far from the truth. 3. Karma Automotive will be bringing its extended range plug-in hybrid luxury sedan back into production before the end of the year. Along with dropping the Fisker Automotive company name, the automaker is fast at work setting up a factory in Costa Mesa, Calif. Parent compay Wanxiang is making minimal changes to the sports car, such as new dashboard displays and some additional safety features. 4.Insurance for self-driving cars: The auto insurance industry won’t be lowering premiums on driverless cars anytime soon, but it may not be a potential fiscal disaster for insurers. Semi-autonomous features like automatic braking and lane departure prevention are already reducing the frequency of common collisions; though high-tech autonomous vehicles may require costlier repairs, according to Moody’s analyst Jasper Cooper in a report. Profits will be cut into long term as accident rates decline, Cooper wrote. Autonomous vehicle leaders are carefully waiting for the U.S. Dept. of Transportation to issue guidelines to help the introduction of self- driving car technology within the next few months. 5. India has very big goal for the next 14 years – having all electric cars on Indian roads by 2030. An aggressive incentive program would allow Indian citizens to obtain electric cars with no down payment, and then use fuel savings to pay for the balance of the cars. It’s a long ways out with a working group now taking shape. 6. Los Angeles-based Evercar has the ambitious goal of bringing zero emission vehicles as shared rides – reducing traffic congestion and smog. Evercar will adding as many as 1,000 vehicles in the gre ater L.A. area, and has been targeting on-demand drivers for Uber and Lyft. These drivers can rent its vehicles for $5 an hour, and handling all fuel, maintenance, and insurance for those vehicles. Evercar is led by Michael Brylawski, and is a subsidiary of Vision Fleet; that company is changing its name to Evercar. 7. Tesla Motors may file suit in federal court to override state franchise laws that prohibit the company form selling its electric cars directly to dealers, avoiding establishing dealer franchise networks. For now, Tesla is negotiating settlements in various states that may permit the automaker to open a specified number of Tesla Stores and service facilities. 8. LG Chem a major battery supplier: As General Motors and other OEMs compete with Tesla with upcoming electric car launches, LG Chem will play a significant role in supplying batteries and other technologies, according to Navigant Research. LG Chem will supply batteries for the upcoming Chrysler Pacifica plug-in hybrid. Daimler, Ford, Renault, and Volvo. The South Korean company is now supplying not only battery packs, but also motors, inverters, and onboard chargers to GM for the Chevrolet Bolt. 9. EPA methane challenge program: The U.S. Environmental Protection Agency (EPA) has launched a new voluntary partnership program that seeks to reduce methane emissions from the oil and gas industry. The Natural Gas STAR Methane Challenge Program has been launched by the EPA with 41 founding partner companies, will focus on achieving cost-effective methane emission reductions from natural gas operations. That will include onshore production, gathering and boosting, processing, transmission, storage, distribution segments, and onshore oil production. This will help lower well-to-wheel emissions and further enhancing the appeal of natural gas powered transportation. 10. Ricardo and Qualcomm partnering on wireless charging: Global engineering firm Ricardo has licensed Qualcomm Halo technology to commercialize wireless electric vehicle charging (WEVC) systems for plug-in hybrids and battery electric vehicles. Qualcomm has granted to Ricardo a royalty-bearing technology license to develop, make, and supply WEVC systems for automakers. Qualcomm subsidiaries will provide technical expertise and engineering support. Ricardo sees WEVC as an enabling technology for automakers to drive mass adoption of EVs by simplifying the charging challenge. Tesla Motors marked a moment in plug-in electric vehicle history on Thursday night by unveiling what could become the first affordable electric car hitting mass-market sales; and getting hundreds of thousands of people to put money down on a car that won’t be coming out any time soon. As of April 7, more than 325,000 orders had been placed with $1,000 down payments for the $35,000 midsize sedan. Deliveries won’t start until late 2017 with rollouts coming in the Spring of 2018 – nearly two years from now. If that many Model 3s are to be sold in 2018, it would more than double the number of EV sales seen in the U.S. in 2015. The roll out of the Model 3 will be closely watched as it competes with the Chevrolet Bolt and other cost competitive, longer range EVs that come to market. Tesla has high hopes on sales going way beyond what’s been seen so far for its first three electric vehicles; and to pay for the billions of dollars invested in engineering design and its Gigafactory lithium battery plant in Nevada. During the launch event, Tesla CEO Elon Musk told the story of what it takes to roll out a safe, affordable electric car with good driving range; and the urgent environmental issues behind it. Musk described as the “Tesla secret master plan.” It all started with the high-priced, low-volume electric sports car, the Tesla Roadster, which has only been built at about 500 units per year. Tesla had to break the mold of slow, ugly electric cars that was the norm for many years, Musk said, and the Roadster was able to do it. 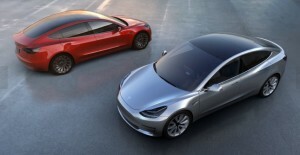 Next came the award-winning Model S sedan, followed by the first electric SUV, the Model X. Musk said half the market wants cars and half wants SUVs, so Tesla extended the Model S platform into the Model X. Musk said that it’s taken multiple iterations and economies of scale to make it all affordable. Revenue produced by sales of the Model S and Model X were needed to move the Model 3 forward. “To all of you who bought the Model S and the Model X, thank you for helping to pay for the Model 3,” Musk said to a cheering audience. After the staged presentation, journalists were given brief rides around the premises but weren’t allowed to drive the vehicle themselves. One reporter said that when the test driver floored the accelerator of the dual-motor Model 3, it had the same power-torque feeling as the Model S. That will be a very good selling point for the Model 3. Safety: Model 3 is being designed to attain the highest safety ratings in every category; with the goal of reaching 5-star safety ratings in all categories once again. There will also be Autopilot safety features. Logo design: Something unconventional, but also used in the Tesla logo for an “e”…….